Have you ever written Santa a letter in candy cane swirl ink? What about decorating your wish list with sparkles that make it that much more magical? 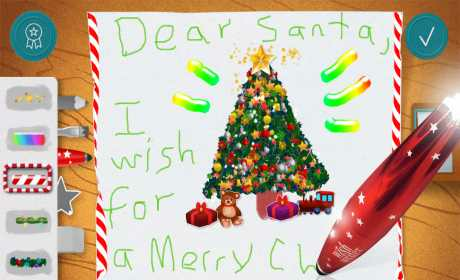 With the Macy’s Wish Writer and app, you can send Santa the most magical letter yet! 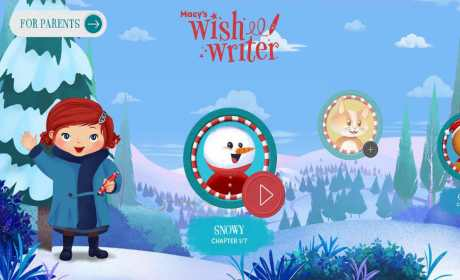 Using this app with Macy’s Wish Writer stylus, kids can use their creativity to write letters to Santa, then explore a whole wintery world of fun­ filled games building snowmen, making holiday cookies and decorating live faces that look just like one of Santa’s reindeer! With the Wish Writer app, kids can make their own magic with holiday­ themed inks, stickers, decorations and more. Let your kids use their creativity to light up the town one good deed at a time! Write a letter to Santa with magical inks like Stardust, animated candy canes, and the Wiggle Brush. Create enchanted snowflakes to make it snow just in time for the Holidays. Stack up a snowman that reaches outer space. Decorate your own delicious holiday cookies. Sled down hills you create to collect ornaments and stars in this action puzzle game. Bake cookies with grandma, help a cat out of a tree, write thank you letters, and more, all in the Good Kid Activity Book. 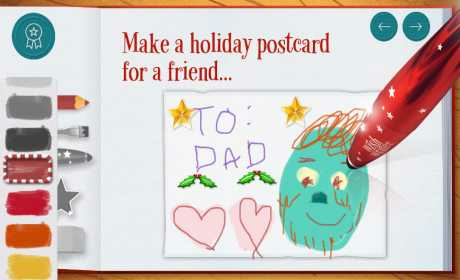 Doodle on pictures of friends and family to give them some extra holiday cheer. Light up the whole town in this action game that puts your tree decorating skills to the test.